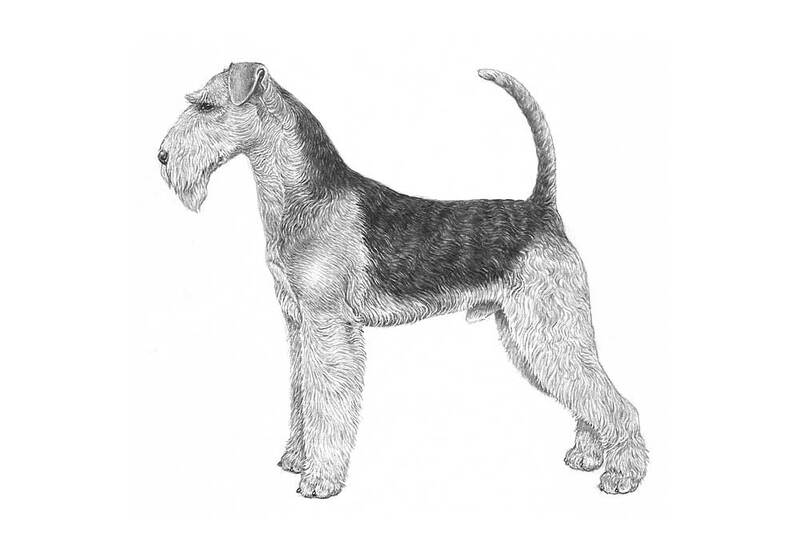 : The Airedale Terrier is a native of Great Britain, from the county of Yorkshire, it is reputed that the Airedale Show gave the breed its name. Many ‘Waterside Terriers’ from the valleys of the rivers Wharfe, Calder and Aire were exhibited at this show, making up a large entry. He is the largest of all the terrier breeds and encompasses all the characteristics of this group of dogs, he is also known as the King of Terriers. : Largest of the Terriers, a muscular, active, fairly cobby dog, without suspicion of legginess or undue length of body. : Keen of expression, quick of movement, on the tiptoe of expectation at any movement. Character denoted and shown by expression of eyes, and by carriage of ears and erect tail. Outgoing and confident, friendly, courageous and intelligent. Alert at all times, not aggressive but fearless. : Well balanced, with no apparent difference in length between skull and foreface. Free from wrinkles. : Long and flat, not too broad between ears and narrowing slightly to eyes. : Foreface well filled up before eyes, not dish-faced or falling away quickly below eyes, but a delicate chiselling prevents appearance of wedginess or plainness. : Upper and lower jaws deep, powerful, strong and muscular, as strength of foreface is greatly desired. No excess development in the jaws to give a rounded or bulging appearance to the cheeks. Teeth strong. Scissor bite, i.e. upper teeth closely overlapping lower teeth and set square to the jaws preferable, but vice-like bite acceptable. An overshot or undershot mouth undesirable. : Level and free from fullness. “Cheekiness” is undesired. : Dark in colour, relatively small, not prominent, full of terrier expression, keenness and intelligence. Light or bold eye highly undesirable. : « V »-shaped with a side carriage, small but not out of proportion to size of dog. Top line of folded ear slightly above level of skull. Pendulous ears or ears set too high undesirable. : Clean, muscular, of moderate length and thickness, gradually widening towards shoulders, and free from throatiness. : Short, strong, straight and level, showing no slackness. : Muscular. In short-coupled and well ribbed-up dogs there is little space between ribs and hips. When dog is long in couplings some slackness will be shown here. : Deep (i.e. approximately level with the elbows) but not broad. Ribs well sprung. : Long, well laid back, sloping obliquely. Shoulder-blades flat. : Perpendicular to body, working free of sides. : Forelegs perfectly straight, with good bone. : Small, round and compact, with a good depth of pad, well cushioned, and toes moderately arched, turning neither in nor out. : Well bent, turned neither in nor out. : Hocks well let down, parallel with each other when viewed from behind. : Legs carried straight forward. Forelegs move freely, parallel to the sides. When approaching, forelegs should form a continuation of the straight line of the front, feet being same distance apart as elbows. Propulsive power is furnished by hindlegs. : Hard, dense and wiry, not so long as to appear ragged. Lying straight and close, covering body and legs; outer coat hard, wiry and stiff, undercoat shorter and softer. Hardest coats are crinkling or just slightly waved; curly or soft coat highly undesirable. : Body saddle black or grizzle as is top of the neck and top surface of tail. All other parts tan. Ears often a darker tan, and shading may occur round neck and side of skull. A few white hairs between forelegs acceptable. About 58 - 61 cms for males. About 56 - 59 cms for females.